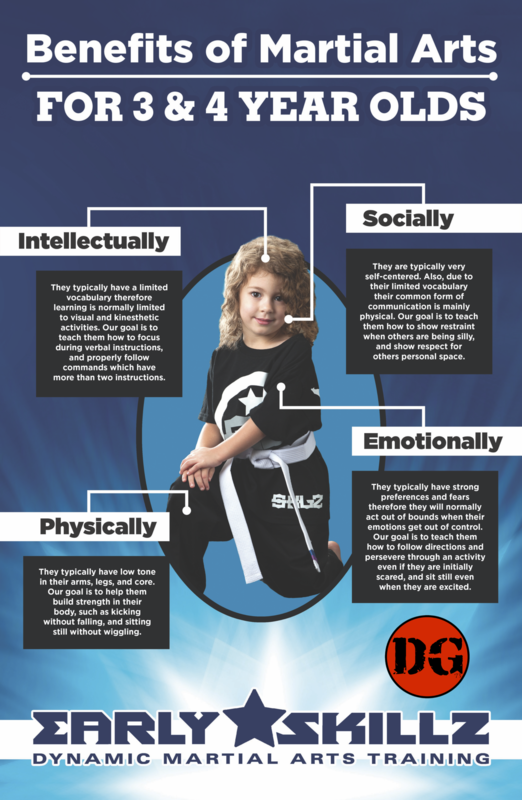 Want to know the science behind our 3 and 4-year old Early SKILLZ Martial Arts program? • Physically- they typically have low tone and poor hand-eye-coordination. We expect them initially to drop their arms when punching and fall when kicking or jumping. We also expect them to have no concept of spatial awareness, therefore they will drop things that are thrown to them and bump into people and obstacles often. The goal for our program is to get them to punch without dropping their arms; kick without falling; jump without falling; and catch objects thrown from various directions and distances. • Intellectually- they typically have a limited vocabulary therefore learning is normally limited to visual and kinesthetic activities. We expect them to initially lose focus when activities are over-complicated. We also expect them to struggle with commands that have more than two instructions. The goal for our program is to get them to follow verbal commands with no visual demonstration. Also, our goal is for them to remember rules and commands without being reminded. • Emotionally- they typically have strong preferences and fears therefore they will normally act out of bounds when their emotions get out of control. We expect them to run off the mat when they have anxiety. We also expect them to shut down when something either scares them or doesn't go their way. The goal for our program is to help them follow directions and persevere through an activity even if they are initially emotional. • Socially- they are typically very self-centered. Also, due to their limited vocabulary their common form of communication is mainly physical. We expect them to mock each other, such as falling when their classmate falls. We also expect them to crash into things when they are excited. The goals for our program are to help them build good social skills such as spatial awareness; not interrupting when others are talking; and taking turns properly. 1. KICKING – Front kicking in the air, alternating legs. They must be able to execute ten kicks in a row alternating legs in order to pass. 2. PUNCHING - Straight punching in the air, alternating arms. They must be able to execute ten punches in a row alternating arms in order to pass. 3. BLOCKING - High blocking in the air, alternating arms. They must be able to execute ten high blocks in a row alternating arms in order to pass. 4. CRAWLING - Bear crawling across the mat. They must be able to bear crawl up and down the floor without their knees or elbows touching the mat in order to pass. 5. HOPPING - Hopping down the floor with both feet. They must be able to hop down the mat with both feet together, and without falling, five times in a row in order to pass. 6. ROLLING - Rolling a ball down the floor. They must be able to roll a ball down the floor while alternating hands, and keeping at least one hand on the ball at all times, in order to pass. 7. RUNNING - Running down the floor. They must be able to run down the floor as fast as possible without falling in order to pass. 8. CATCHING - Catching a ball thrown underhand from one step away. They must be able to catch a ball five times in a row in order to pass. As you can see we take Martial Arts training to a whole new level! We use early elements of traditional Martial Arts curriculums to build skills that are appropriate for 3 and 4-year olds. This means that your child will learn and grow at a pace that is not too easy, nor too challenging. The best part is the Early SKILLZ program will equip your child with skills that they will utilize in every area of their life!